Policy makers gathered in Kigali, Rwanda this week and made a historic decision – to phase out the production and use of hydrofluorocarbons (HFCs). 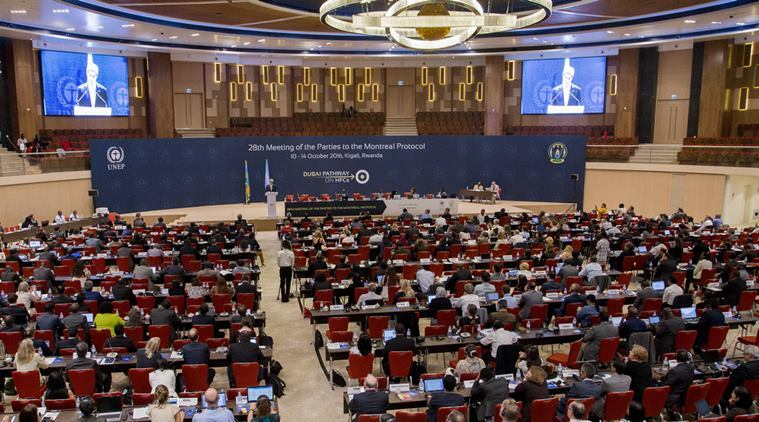 The 28th Meeting of the Parties (MOP 28) to the Montreal Protocol was held in Kigali and it drew to a close a few days ago after passing the Kigali Amendment to the Protocol. According to the United Nations Environment Programme (UNEP), the significance of the Kigali Amendment is that it is believed to be the “single largest contribution the world has made towards keeping the global temperature rise ‘well below’ 2 degrees Celsius.”. The ozone layer, found in the stratosphere, shields the Earth from harmful ultraviolet (UV) radiation. Exposure to UV radiation can cause skin cancer, cataracts and other irritations. In 1987 scientists discovered a large hole in the ozone layer above the Antarctic region. The discovery of the ‘hole in the ozone layer’ led to the creation of the Montreal Protocol on Substances that Deplete the Ozone Layer. Nations came together and designed this agreement to ensure the reduction in production and consumption of ozone depleting substances. The Montreal Protocol entered into force in 1989. Chlorofluorocarbons (CFCs) were identified as the primary cause of the breakdown of the ozone layer. They are mostly used in aerosols and as refrigerants. The use of CFCs was phased out gradually and they were replaced by HFCs which were believed to be less harmful to the ozone layer. However, HFCs are a strong greenhouse gas, making them responsible for the warming up of our planet. Although HFCs make up a small percentage of greenhouse gases in the atmosphere, they have as much as 1000 times the global warming potential (heat trapping ability) of CO2. The use of HFCs has increased rapidly over the last few years with the growing demand for cooling. This is especially true in the developing nations which have relatively hotter climates and an expanding middle class, who are now able to afford air conditioners in their houses. Therefore the Kigali Amendment allows developing nations to phase out the use of HFCs at a slower rate than the developed nations. The richest nations including USA and the EU will halt production and consumption of HFCs by 2018. Almost all the other countries including China, Brazil and the African continent hope to freeze HFC use by 2024. A small group of the world’s hottest countries – India, Pakistan, Iran, Saudi Arabia and Kuwait – are expected to phase out HFC by 2028. Although the Montreal Protocol was designed to solve the problem of the deteriorating ozone layer, this week it was used as a tool to address the issue of global warming. This sort of improvisation is necessary when handling environmental issues. Sometimes a solution we put forward to a particular problem can turn out to be a bigger problem in a different sense. What is important is to acknowledge this fact and to take action as soon as possible. The Kigali Amendment is a big win for everyone, especially for our ailing environment. This is a small yet significant step in our journey towards combating climate change. There is so much more to be done and I believe it can be done, just as long as our policy makers and scientists work hand in hand! Make it worth a miss!